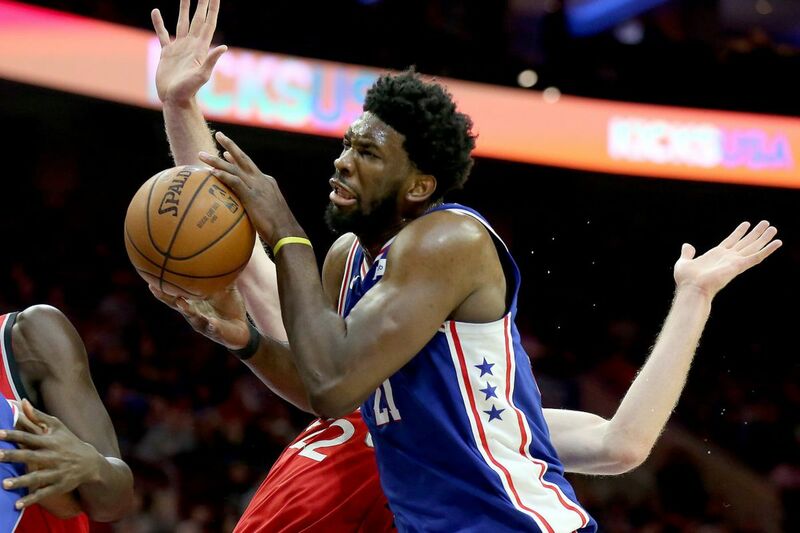 Sixers center Joel Embiid shot 11-for-21 from the field and grabbed five offensive rebounds in Monday’s 117-111 win over Toronto. Joel Embiid can score in a variety of ways, but when he goes down on the blocks and wants to punish teams in the low post, he is almost unstoppable. That was evident Monday in a 117-111 win over the Toronto Raptors during a Martin Luther King Day matinee at the Wells Fargo Center. Embiid finished with 34 points and 11 rebounds (five on the offensive glass), and made 11 of 21 shots from the field. He still did stray away from the basket and hit just one of five three pointers. But Embiid made a concentrated effort to go low, and when he did, the Sixers benefited greatly. It was a drastically different performance than his last outing, when Embiid had 15 points on 6-for-17 shooting and 10 rebounds Thursday in a 114-103 loss to the Boston Celtics in London. He also had no offensive rebounds. "After the Boston game, I felt like I was floating around the perimeter too much and I talked to the coaches about it and we changed the game plan and I was more of an inside presence," Embiid said. The coaches were in agreement. "We talked a lot about roll [to the basket] more, offensive rebound more, get deep catches — you are Shaquille [O'Neal], you are not Dirk [Nowitzki]," Sixers coach Brett Brown said. That was Brown's way of saying that this was a game when he wanted Embiid to be a low post player. It was an extremely physical game, one very much to the liking of Embiid. "I loved it," Embiid said. "That's what I live for, being physical. I enjoyed it." Embiid played 34 minutes and 43 seconds. What was most impressive to Brown was how he played down the stretch. In the fourth quarter, Embiid played 10:16 and had nine points and five rebounds. He was consistently working down low and shot eight free throws, making seven. "We went to him late, drew some stuff and found him, and to his credit he got to the line and made his free throws," Brown said. Because of various injuries, Embiid hasn't always been able to practice with the team. Sunday was the first time the team practiced since returning from London, and according to Brown, Embiid was very engaged. "The more and more we can get him to practice and be with us and increase his fitness base, and it is coming, there is something incredibly special in Joel Embiid, as we all know," Brown said. "But it is really driven when his fitness base is at a level that lets him play 30 whatever minutes and late in the fourth periods."